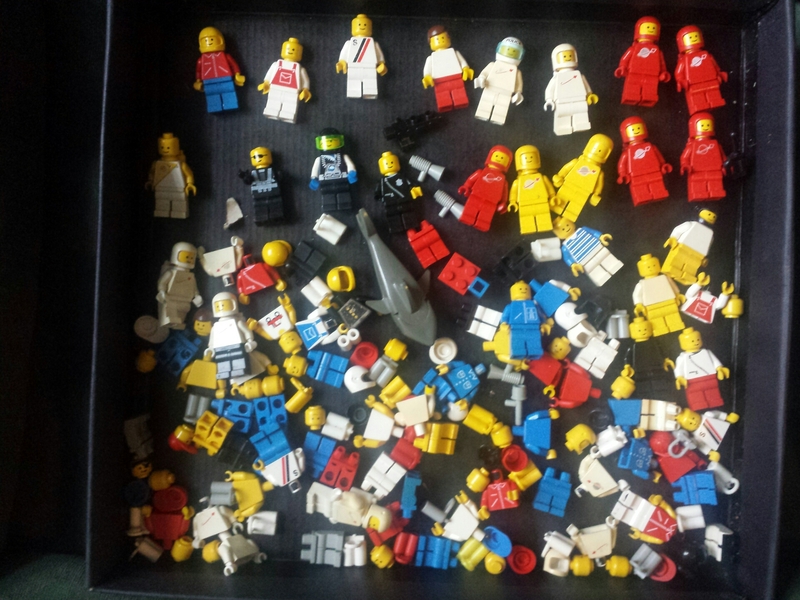 Just unearthed a trunk of early 80's / 90's Lego. Best way to sell it on? Hi guys. I recently came across a trunk of lego from my childhood. Im currently sorting the blocks into colour sets so i can figure out what i actually have. I've seen that people sell bundles of Lego on eBay based on weight that seem to do pretty well. Is this really the best approach? Any help will be appreciated. Obviously if you guys are interested in anything ill post up some pictures of what i actually find. It is if you have a load of crap left after cherry picking all the good stuff. What you do now really depends on how much time you want to spend sorting it - sets will sell better (for more money) than unsorted lots. But they take time to sort. 1. If there is anything they can buy off of you here. EG: you may just have a bunch of dirty common pieces. OR... you could have a complete monorail set. Huge difference in terms of value and interest! I would be surprised if i come up with anything of value. Pretty sure i was a fairly destructive kid back then, as most of us probably were. They didn't have a special laser gun that came with them like newer minifigures do today ie Star Wars. The communicator was just a walkie-talkie and is a very common part. I wouldn't worry about finding them. Here are some of the figures i've pulled out so far. Found quite a lot of computer console designed pieces and 'Police' labled bricks. I must have been a fan of the old Space Police sets. If you're trying to sell the whole bundle in one shot, you really don't need to sort them too much. A little strategic arranging and good pictures from a lot of angles will do the work for you; make sure you dig out the minifigures and their accessories, get a good shot of them... if you have road plates, they make a good backdrop for minifigs! As for the pile(s) of elements, try and get themed stuff to the top of the pile, and anchor it there with any unique or iconic bits you might have; like, if you've got a blue brick with LL928 printed on it, you don't want that buried in the pile, you want that where folks can see it. Same goes for stuff like spoked antennas that aren't broken, or transparent pieces that are in good shape, try and get those out of depths of the pile where they can be seen, too. If you're selling the collection in one shot, make sure you denote that in the title or description; note that it's a collection, and not a 'lot' or 'bulk' or anything that makes it seem like you weeded or filtered sets out. Thanks for the input. My plan was to colour seperate them and then group them with their relevant designs. The rest of it just sell off as a bulk. Do you think its worth just selling it on as a collections rather than sifting through? Oh and randomly i have at least one LL918 piece i've come accross so far. What about parts that are cracked or chewed up? I have never sold a lot that had damaged bricks or minifigures. Does he take the time to weed all damaged bricks? Based on the above image, looks like you have quite a few classic Space sets (early 80s), maybe a Blacktron set, and a bunch of Town sets from a slightly later era (late 80s) - my guess is the Town Airport, the grand prix set, and maybe a couple of other stunt sets. The shark suggests there is a Pirate set in the mix as well - that or an early coast guard set. Starting with the minifigs and rare parts is definitely the best way to identify and narrow down sets. From there, it is probably worth checking out prices for used and complete sets on Ebay and Bricklink to decide whether it is worth the effort to piece it all together. My guess is that your classic early space sets will be desirable if complete. From there, I would post the available sets on here first in the Marketplace section. We're great people and you'll probably find that you can get close to what you would have gotten on the other sites, but you cut out the ebay fees. You also might find someone to take a few sets as once off you, which will save on shipping. One final thought -- before you do sell, make sure you want to get rid of it. You may want to hold back at least a couple of favorites for nostalgia purposes. Thanks again for all the advice. Im currently surrounded by pieces that im separating. Once ive found some key pieces hopefully ill be able to identify some of the sets they originated from. If i find anything else interesting ill post it up! Maybe I'm a different cat, but when I buy collections, I prefer warts and all. That said, folks wanting investment-grade Lego might want the work done for them, especially if it's being advertised in terms of weight as opposed to content. I would say you will likely make more putting them back into sets. If you do not want to do that (or find many parts are missing to complete the sets) it would then be better IMO to sort by color, sort out all of the minifigs and then sort all of their accessories (wrenches, walkie talkies, etc.) and instructions, and group them all together (IE bag for each color of part, bag for figures, bag for their accessories, etc.). Also keep them all together in one auction/listing from the viewpoint of a collector/buyer. Also, if you can, ensure they are clean. That will help with how much you make I think. All of this work requires a bit of elbow grease, but I do believe it matters to those looking to buy a lot if they see it sorted, non-LEGO or broken LEGO removed, and cleaned and it will reflect in how much someone is will to pay if most of the grunt work is already done. Or put the non-lego or broken LEGO into a separate bag and include it but keep it separate from the rest. Ive just spent the past 3 days separating everything into colour, which took much longer that i thought. I have gotten rid of all the non lego and junk pieces so all that's left now is to give it all a good clean and attempt to section them into set types. If i can find some pieces that help me identify which set they came from then maybe i can track down some instructions online.